The crescent moon, Mars and red supergiant star Antares shine over the bright lights of Baku, Azerbaijan. 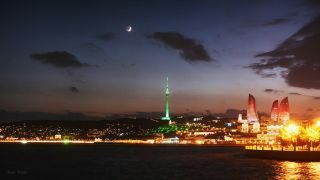 Tunc Tezel of The World at Night took this photo on Oct. 18. The bright lights and flaming towers of the city of Baku share the spotlight with a stunning crescent moon, Mars and the bright star Antares in this night sky photo. Veteran astrophotographer Tunc Tezel of The World at Night took this photo on Oct. 18 from Baku, Azerbaijan. "Seeing both objects with similar color and magnitude sharing southwestern sky in the evening helps remind how aptly Antares is named, the Rival of Mars . Flame towers accompany the red planet and reddish Antares with an orange-red of their own, " Tezel said. At roughly 550 light-years from Earth in the Milky Way galaxy, the red supergiant star Antares shines brightly in the night sky. A light-year is the distance light travels in one year, or about 6 trillion miles (10 trillion kilometers).